In my effort to streamline the way I do things in the kitchen, I thought it was about time to redo the pantry that I rely on every single day. One’s pantry, whether it is a large walk-in space or a simple cabinet or two, should have everything one needs within arm’s reach. Here at home the pantry is nothing more than two cabinets with several adjustable shelves, yet it’s perfect for my family. It is where I keep all of the essentials such as legumes, rice, pastas, sugars, oils, juices, teas, coffee, extracts and canned goods. 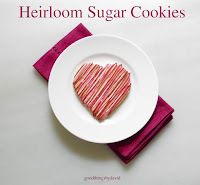 I’m always reaching in there for something whenever I’m baking or cooking (or snacking!). 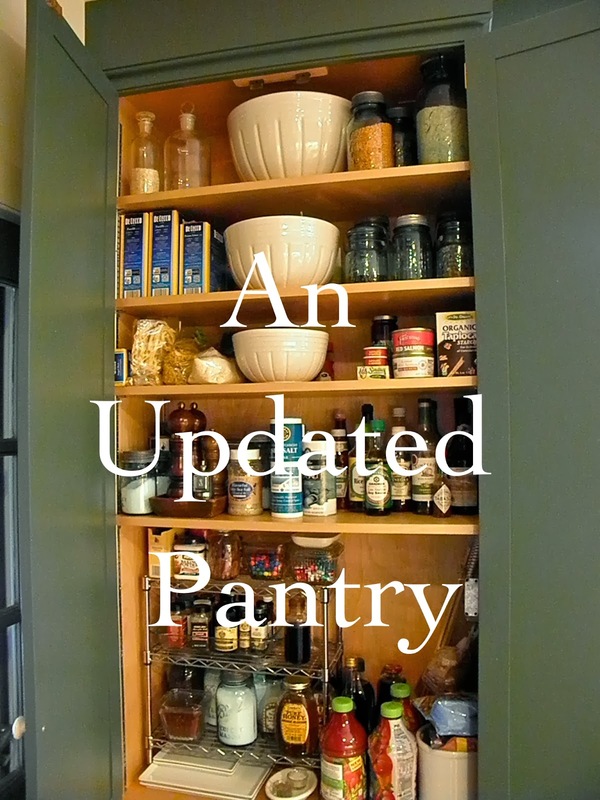 Updating the pantry was not as difficult as I had imagined, because it was simply a matter of moving shelves and placing items where I needed them most. I had been wanting to do this for quite some time and finally the other day I did just that. What prompted this you’re asking? To be honest, the layout of these staples wasn’t working for me anymore. I was finding myself getting rather annoyed at having to search while on a step stool for the baking ingredients I was now using on a daily basis. The first thing to do was to remove every single item from the pantry onto the counters and kitchen table. After wiping the pantry shelves, walls & doors thoroughly, I moved the pegs around and measured bottles, ball jars, pasta boxes and whatnot so that they would fit perfectly. It was then time to start placing my ingredients just so. I’ll show you before and after photos. Before (left) & After (right). As you can see, there is nothing dramatic. I've changed pasta brands, have removed some tin containers and removed those collectible Martha by Mail 2 gallon apothecary jars. You can see that the bottom shelf of the upper cabinet was moved up to make room for a steel wire shelf. On the uppermost shelf I placed my legumes and grains which I keep stored in antique Ball jars. It's a good idea to keep these items in clear jars so that you can see when they need to be replenished. I also have old apothecary jars with narrow openings that hold a few ounces. These have the smallest of grains. The large bowl (Martha by Mail) has bags of rice from around the world ready to replenish my jars. After changing brands I moved the tube pastas to the next shelf down. Some of the Ball & Atlas jars on the other side of the bowl have legumes and some are empty. The next shelf has long pastas, such as spaghetti, fettuccine and linguine. I also keep my canned goods, olives and starches here. The shelf below that has various types of salts, peppers, French grinders, condiments and vinegars. 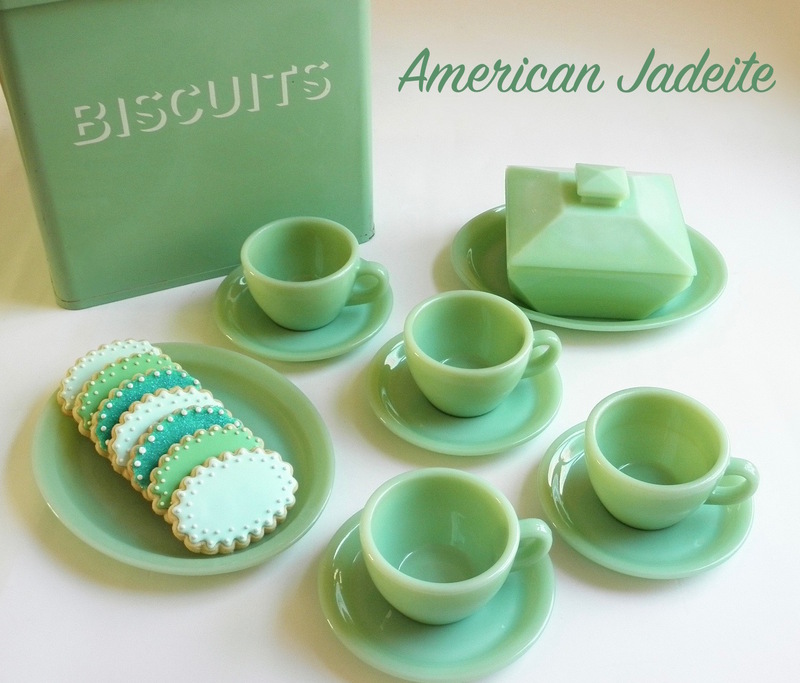 If you look closely, the salt & pepper grinders are on a small tray to catch any bits. As much as I love my pepper mills and salt grinders, these tools always leave a small mess. I'm so happy with this bottom shelf. What I did was place an adjustable steel shelf in here to make more room. This is my small baking ingredients station. I wanted to fit one of my stand mixers next to it, but quickly realized that the pantry was much to shallow. Trying to fit it sideways didn't work either. This small baker's shelf has leaveners, cinnamon sticks, extra spices, extracts, some vanilla beans & paste. Flavored sugars (vanilla, lemon & orange) are kept in old Ball jars and cocoa powders from France & Belgium are stored in other glass containers. Oh, and if you didn't notice, the glass containers that have M&Ms and chocolate kisses are for me (don't tell)! Next to this I keep larger bottles of other essentials such as tomato juice, maple syrups, pomegranate juice and extra virgin olive oils. The bottom portion of the pantry is very simple. 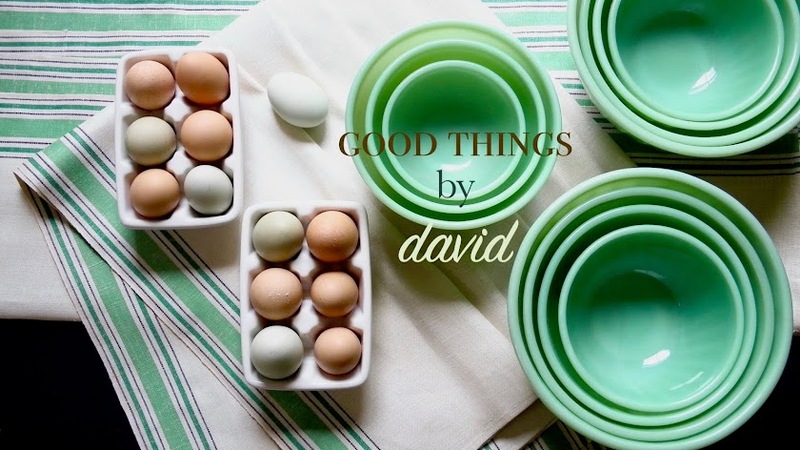 Shelf-stable milks (perfect for baking), small dishes and aprons and old tins (these are nice to keep twist ties, rubber bands and snack clips), are all within easy reach. Below that I have dried fruits, nuts, cooking sprays, and other items. The bottom shelf has multiple bags of brown sugars and confectioners' sugars as well as a jar of morello cherries ready for the moment I begin craving a Black Forest Cake. These old-fashioned wire cooling racks are great for keeping my dried fruits together. I can just pull the rack out or spin it around to find just what I need. I'm quite happy with the way my pantry is now. I finally have everything where I need it to be. No longer do I have a hodgepodge arrangement where I have to search for an item. That isn't to say that my former pantry was in disarray or a complete mess, but it did need reorganizing. The set of bowls that I do so love are now front and center in the pantry and I can pull them down if I need to use them. 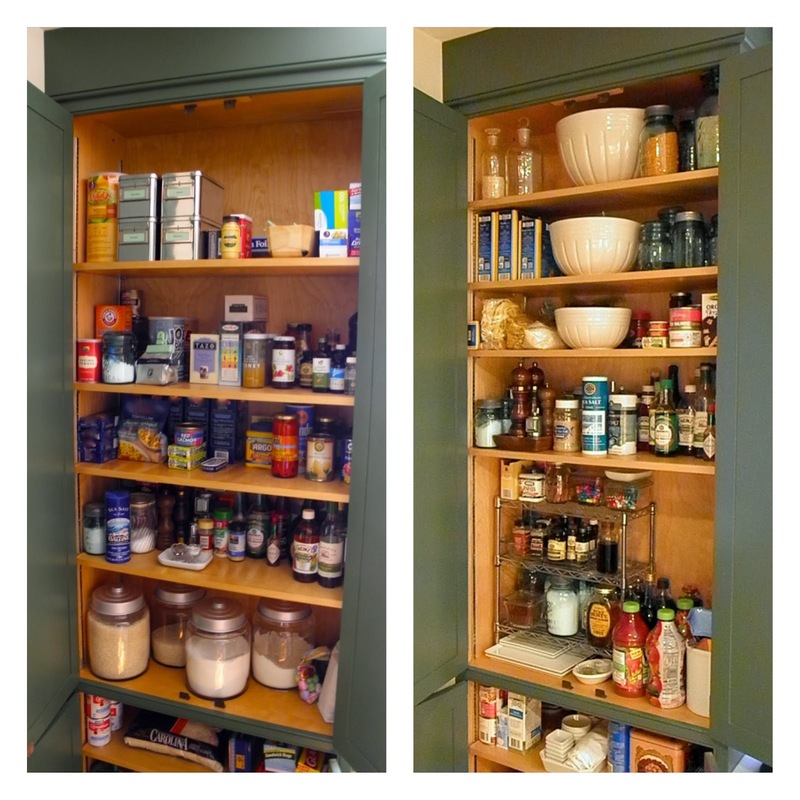 This whole project of rearranging and reorganizing the pantry only took a couple of hours over the weekend. Why not put it on your list of things to do this year? I guarantee you will feel infinitely better once you take care of your pantry and make it work for you and your family. After all, you're the one cooking and baking in your kitchen, so you might as well arrange it to suit your needs. I don't suppose you want to come and organise my cupboards for me David! Hope that you are staying warm and safe in the horrid weather you are having. Yes, it's brutally cold this morning. Much of the country is in a deep freeze, so it's not the best weather. Love that you stored your excess items within the bowls! Such a beautiful pantry. Thanks Mally! Yes, it makes sense to store those extras inside the bowls. One of them has chip clips! The others have grains, rices & legumes. If there are any leftovers when I'm refilling the Ball/Atlas jars, I seal the bags with a clip and keep them in the bowl. You've been looking in my pantry, haven't you? Now, I'm shamed into reorganizing it! Great tips, David. I like the way you have things grouped and organized. I'll tackle mine this weekend! Excellent, Kenn! Send me pics of your finished pantry. Hey, we can all use a little touch up in the pantry. Hi! I am a first time visitor to your blog and I am quite enjoying reading it thus far! What a beautifully organized pantry you have! I love that you use your Ball and Atlas jars! I have quite a few of them, but I am so nervous about breaking them and can't quite bring myself to use them for everyday use. But in case I work up the gumption, do you use the original milk glass lids? If so, have you had any problems with using them? I have found all my jars at thrift stores, garage sales or antique stores and it seems like no matter how hard I try, I just cannot seem to get them quite clean enough on the inside, which is the other reason why I haven't used them yet. I'm so glad you're enjoying the blog! Thanks. As for the Ball & Atlas jars, I think you should not be afraid of using them whatsoever. I too find the lids a bit difficult to clean off and under no circumstances do I soak them in water. I simply use a damp towel and try to get them as clean as possible, and then dry them thoroughly so that they don't tarnish. The milk glass inserts are in many of my jars and I have never had a problem with them; don't worry about that. I would never recommend that you use them for canning or for storing cooked food in the refrigerator. Store those items in contemporary containers, not vintage! :) Use the vintage ones for dry storage only. Enjoy your Ball & Atlas jars, Tabitha!! Thanks for the tips on cleaning the lids! I had read that they should never be soaked, so I have avoided that, no matter how much some of them looked like they needed it. It's good to know that you've never had any problems - I think I will have to bite the bullet and use a few for dry goods. When I get around to organizing my pantry, of course! I learned how to make and can applesauce this last fall and of course I had to buy some of the new blue Ball jars - who could resist those beauties when compared to the regular jars? Not I! Putting up applesauce in new Ball Jars sounds wonderful! So delicious and so good for you! Thanks for the input and support. I love that you too collect Ball Jars like I do. They're indispensable in the kitchen!